Oaks Farm, Reepham. This was an upstairs room in some outbuildings of a small farm and builder's yard near the centre of Reepham, the subject of a sale in 1970. This room had remained virtually untouched since the early years of the 20th century. 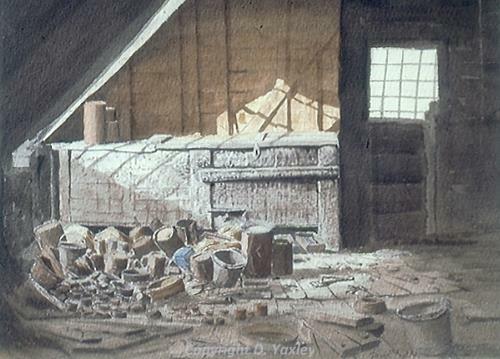 The big chest in the centre, half-full of linseed oil, with the lightingof the room and the clutter of old pails, paint tins, planks, sieves, keys etc., posed an interesting challenge to the artist. I made a couple of arches from some seasoned oak planks that I bought at the sale and built them into my own house.